CRC 2019 Pesach Guide, pages 81-83. Star-K 2019 Pesach Guide pages 97-100. These lists are good only for Passover 2019 ONLY. I urge you to consult with your local halachic authority and not to rely on Rabbi Internet for any halachic questions you might have regarding pet food on Pesach. 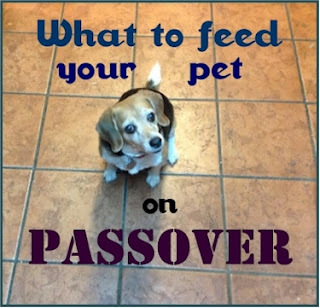 On Passover/Pesach, according to halacha (Jewish law), a Jewish person may not even "derive benefit" from chametz, which means that while your pets do not need to keep kosher, you may not feed them food containing chametz on Pesach. You many, however feed them food containing kitniyos, such as rice or corn (even though Ashkenazic Jewry has a very strong custom not to eat kitniyos on Passover). Per the Star-K, you don't need to buy a new food bowl for your pet on Pesach, but you must wash out your pet's bowl very thoroughly and remove all traces of old food. The lists below were taken from the two kashrus sources cited above, the CRC and the Star-K. Even when purchasing a brand name mentioned on this list, make sure to check all labels, and if you see an ingredient that gives you pause, call or email a halachic authority. There should be no chometz listed. A product listing both meat and dairy ingredients may also not be used any time during the year or on Pesach. FYI, there are very few reasonably-priced dog treats that are kosher for Passover, so here's what we do. (This is for gebrokts-eating homes only.) After a meal with chicken soup and matzoh, when we clear the table, we dump all the leftover soup (make sure there are no bones!) into a plastic disposable bowl and then break up all the leftover matzoh into the leftover soup. The matzoh absorbs the soup. Then we give it in little bits to our dogs as treats. They love it. Awesome frugal treat. In addition to checking for the five chametz grains – wheat, barley, rye, oats, and spelt – also look for brewer’s yeast (a common flavoring agent, which is chametz), malt (a barley-based sweetener), pasta, xanthan gum (a thickener which may be fermented from chametz), and other generic terms which may refer to a chametz ingredient (e.g. flour, gluten, cracked, ground, groats, hulled, middlings, starch, et al). Any questionable ingredient should be reviewed by a competent rabbinic authority. Many varieties of animal feed contain a multitude of vitamins, minerals, and amino acids, some of which may well be chametz, and there is no realistic way for a consumer to determine which of them are problematic. However, the good news is that vitamins comprise such a small percentage of the animal food that they are batel (nullified). 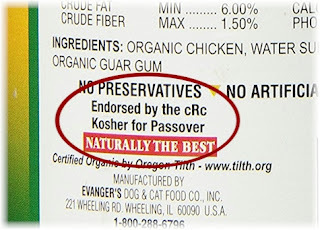 Therefore, it is generally accepted that if the animal food was created before Pesach, it may be used on Pesach. Animal, poultry and fish products. Vegetables, such as alfalfa, asparagus, beets, and carrots. Assorted kitnios foods, such as beans, buckwheat, brewer’s rice, corn, grain sorghum (milo), lentils, millet, peanuts, peas, rice, sesame, soybeans, soy flour, and sunflower. Other items, such as barley grass, BHA, BHT, carrageenan, cellulose, colors, eggs, gums (other than xanthan gum), kelp, lactose, linseed, milk products, molasses, oils, and psyllium. By no means do these pointers cover all of the ingredients used in pet food, and you might want to be in touch with a kashrus professional if you are unsure about any of the other ingredients in a given pet food. Pet food with gravy often contains chametz. Read the ingredient panel carefully. Feed available at zoos is often chametz and should not be purchased or fed to the animals on Pesach. Mixes sold in stores often contain chometz. It is advisable for pet owners to slowly wean their pets off their regular chometz pet food diet. This is accomplished by mixing regular and Pesach food between one and two weeks prior to Pesach before switching completely to Pesach food. The ratio of regular and Pesach food should be changed slowly to get the animal used to the new diet. Check with your veterinarian before changing diet. After Passover, pet food with chametz may be purchased only from stores which are non-Jewish owned (e.g. PetSmart, Petco) or Jewish owned and have sold their chametz. Make sure you check with your local Va'ad regarding which stores are okay for buying pet food immediately after Pesach (you want to avoid chametz she'avar alav haPesach, just as with people-food). Pesach (for your pet only!) from the CRC, and I felt they deserved their own mention. You can get Evanger's pet foods on Amazon here. Make sure the description mentions the CRC kosher supervision and double-check for it when the product arrives. The links here go to the Amazon page for the brand name mentioned; make sure to only buy those flavors listed that are kosher for Passover. Evanger’s: when bearing cRc Passover approval, including: Beef Tips with Gravy; Chicken Dinner for Cats; Freeze-Dried Beef Liver; Freeze-Dried Beef Tripe; Freeze-Dried Wild Salmon; Organic Braised Chicken Dinner for Cats; Organic Turkey and Butternut Squash for Cats; Slow Cooked Beef Stew for Cats – Grain Free; Slow Cooked Chicken Stew for Cats – Grain Free; Slow Cooked Turkey Stew for Cats – Grain Free; Wild Salmon. Prescription Diet: a/d, d/d except duck, m/d canned only, r/d, s/d, t/d, zd. Evanger’s: When bearing cRc Passover approval, including: 100% Beef; 100% Buffalo; 100% Chicken; 100% Duck; 100% Organic Chicken; 100% Organic Turkey with Potatoes and Carrots; 100% Pheasant; 100% Sweet Potato; All Natural Beef Liver Chunks; Beef, Chicken, & Liver; Beef Chunks Dinner in Gravy; Beef Dinner; Beef with Chicken; Braised Beef Chunks with Gravy; Catch of the Day; Chicken Chunks Dinner in Gravy; Cooked Chicken: Duck and Sweet Potatoes Dinner; Freeze-Dried Beef Liver; Freeze-Dried Beef Tripe; Freeze-Dried Wild Salmon; Hunk of Beef; Lamb and Rice Dinner; Lamb Chunks Dinner in Gravy; Senior Dinner; Turkey Chunks Dinner in Gravy; Whole Chicken Thighs; Wild Salmon. Hills Ideal Balance Grain Free (dry): Adult Natural Chicken & Potato. Mighty Dog: (canned no gravy): Chicken Egg & Bacon Country Platter, Chicken & Smoked Bacon Combo, Hearty Beef Dinner, With Lamb and Rice. Prescription Diet: a/d, d/d, h/d, s/d, u/d, r/d. Wellness Core Grain Free (dry): Ocean, Original, Reduced Fat, Small Breed Original. Fish food and vacation blocks (including pyramid feeders) often have chametz. The following are acceptable: Zoo Med Laboratories Giant Plankton Banquet Block Feeder and Tetra Tropical Slow Release Gel Feeders (Tetra Weekend 5 days, and Tetra Vacation 14 days). Goldfish and tropical fish can be given the following items, provided they do not contain fillers: tubular worms, frozen brine shrimp, and freeze dried worms (if they do not contain fillers). Millet and sorghum as main diet. Peanuts, sunflower seeds, and safflower seeds can be given. Larger birds such as parrots can eat pure alfalfa pellets (make sure it is pure alfalfa since it is common to add grains) or dry dog food (see above for list). Smaller birds can also have pure alfalfa pellets; crush before feeding. Can supplement with cottage cheese, rice cakes (birds like to eat these), small pieces of lean meat, matzah, sliced grapes, berries, eggs, canned baby fruits. All large food should be shredded before serving. These items should be given sparingly. For minerals, can have oyster shells (calcium) or mineral block, such as Kaytee Tropical Fruit Mineral Block Treat. The greater the variety, the better. Best to feed pure alfalfa pellets. Make sure it is pure alfalfa since it is common to add grains. Dried alfalfa may also be given. Can supplement with mixture of cut-up fruits and vegetables – carrots, broccoli, apples, melon, kale, parsley, oranges, celery, dry corn, sunflower seeds, cabbage. Can also give some matza. If not accustomed to these items, give sparingly. Guinea pigs especially will benefit from kale, parsley and oranges. Hamsters especially will benefit from apples. Hamsters: Sunflower seeds, potatoes, small amount of greens and vegetables; can supplement with grapes, apples, melon, and, oranges. If not accustomed to these items, give sparingly. Guinea pigs need vitamin C added to diet. Pure Timothy Hay is not chometz and may be used. Guinea Pigs, Rabbits, and Chinchillas: Timothy hay, greens, and vegetables; can supplement with grapes, apples, melon, and, oranges. If not accustomed to these items, give sparingly. Guinea pigs will especially benefit from kale, parsley, and oranges, in sparing amounts. The orange will supply needed vitamin C to their Pesach diet. Iguanas, Tortoises, and Turtles: Greens and vegetables; turtles can also have small amounts of raw chicken or cut-up earthworms. Be aware that mealworms, which as living creatures are not chametz, are commonly sold in a bed of wheat flakes or oatmeal, which is chametz and, therefore, may not be owned or used on Pesach. Live crickets should be gut-fed on bits of potato and vegetable 24 hours before feeding to lizards, to enhance their nutrition for the lizard. Whole insects (live or dead) with no additives or other ingredients are permissible.